America Inc. had a good year selling to allies. American defense contractors are making good on their promise to boost sales overseas. That diversification should come in handy as the Pentagon budget slows and domestic growth becomes more challenging. U.S. contractors totaled $55.66 billion in foreign military sales in the recently completed government fiscal year, a 33% gain over prior-year totals, according to a report released by the Defense Security Cooperation Agency. Raytheon's Patriot Missile defense system is among in-demand U.S. products globally. Image source: Raytheon. While these numbers tend to fluctuate year to year, the industry has a bit of a winning streak going. Last year's $41.93 billion total was a 24.8% increase over fiscal 2016, and with the current administration focused on streamlining the sales process and encouraging further orders, there's reason for optimism that the trend can continue into the new year. The 2018 total includes about $4.42 billion funded by the Defense Department and $3.52 billion funded by the State Department along with pure foreign government buys. The deals include large aircraft and equipment sales, including Boeing (NYSE:BA) deals to sell surveillance aircraft in Asia, as well as increased global interest in U.S. missile and missile defense. Lockheed Martin (NYSE:LMT) and Raytheon (NYSE:RTN) have had success selling the Patriot missile defense system and the THAAD anti-ballistic defense system. President Donald Trump and White House officials have been very vocal in pushing NATO members and other allies to increase defense spending, with the administration last April rolling out a "Buy American" program that eased restrictions on foreign sales and encouraged certain U.S. diplomats to take a more active role in facilitating sales. Those moves were not without controversy, with human rights advocates and arms control proponents worrying about more sophisticated weaponry falling into more hands. Many career State Department officials have balked at the idea of serving as an outside sales force or advocates for U.S. corporations. But despite the protests, the push seemingly is having the desired effect. In fiscal 2018 government officials cleared about $70 billion in potential foreign deals. While many of those have not yet been negotiated and confirmed, it gives the contractors a powerful pipeline to use to keep the winning streak going. Military officials said that there are 14,556 foreign sales "open cases" currently being considered by the DSCA for equipment ranging from spare parts to new aircraft. "There has never been better cooperation between industry and the interagency," Lt. Gen. Charles Hooper, director of the DSCA, said during a conference in Washington where the sales total was announced. "In my experience there has never been a time where there has been as much alignment, and as much cooperation." The United States is, by far, the world's top military spender, accounting for $610 billion of the $1.74 trillion spent in 2017, according to the Stockholm International Peace Research Institute. Still, it is dangerous to be overly reliant on one customer. A period of Washington budget battles earlier in the decade froze defense spending and sent defense shares tumbling, causing contractors to look overseas for growth. Among U.S. contractors Raytheon, with its mix of advanced armaments, electronics, and defense systems, has been a leader in foreign sales, but others including Lockheed, Northrop Grumman (NYSE:NOC), and General Dynamics (NYSE:GD) have also made international growth a priority. There are risks to the more aggressive White House stance. Calls by the U.S. for NATO allies to increase spending could help to revitalize a somewhat dormant European defense sector, potentially creating domestic alternatives for big-ticket purchases that would have otherwise been expected to go to U.S. titans. 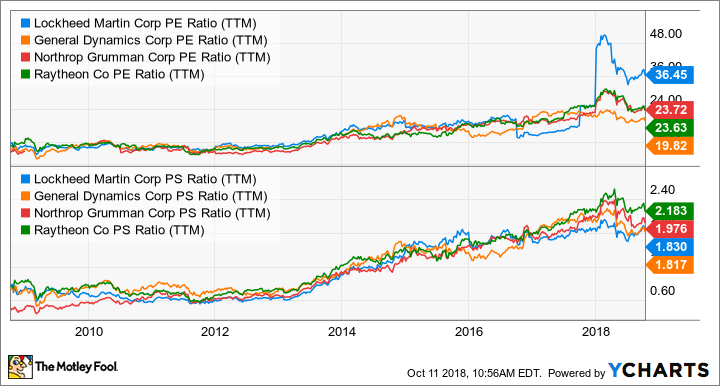 Defense P/E and P/S Ratios (TTM) data by YCharts. But with Pentagon officials already signaling that they expect their budget to be flat in fiscal 2020 after two years of exceptional growth, that foreign slice of the pie is only going to grow in importance in the years to come. Foreign sales leaders like Lockheed Martin and Raytheon currently generate 30% or more of their revenue from international sales and are seeking to increase that percentage over time. With defense shares trading near 10-year highs in terms of earnings and sales and Pentagon growth expected to slow, these companies are going to need new sources of revenue in the years to come to sustain the rally. The fiscal 2018 foreign sales totals are a good sign for the industry. Assuming those totals are indeed repeatable, the case for buying into the sector even at these inflated levels is a lot easier to justify.